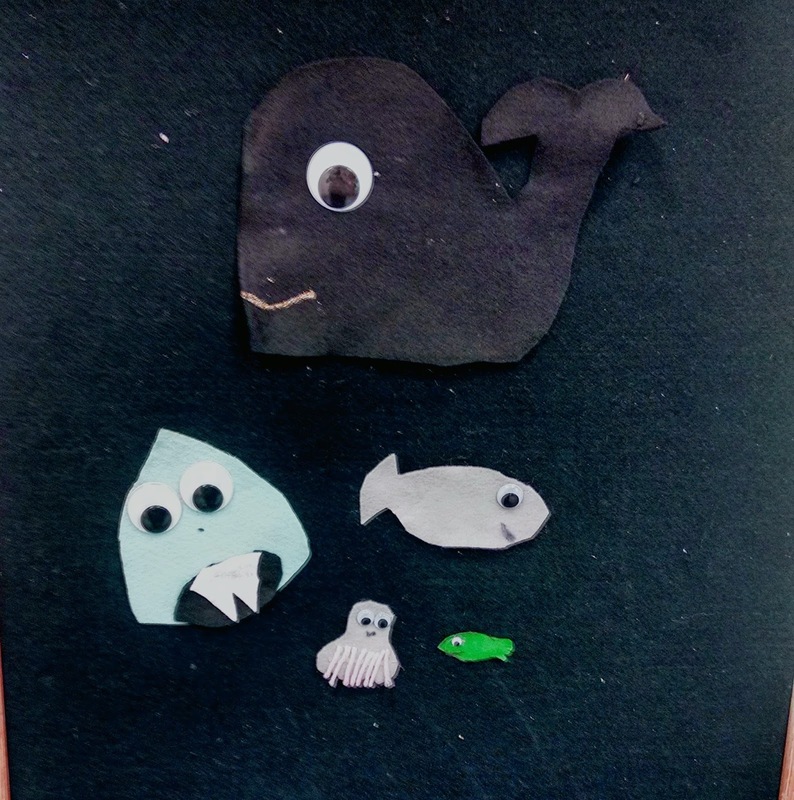 I loved doing a program this week that included Raffi's "Baby Beluga", a beautiful new book called "Breathe" and Lois Ehlert's "Fish Eyes" because it enabled me to do all my favorite fish songs. I posted "Three Little Fishies" on an earlier Flannel Friday. Once again, it was a great song to do. If you are brave enough to sing it a capella, get the kids and parents to clap rhythmically for the "Boop Boop Diddy-Daddy" part and they'll have a great time. I love doing "Baby Shark" with the babies, the toddlers, and especially with the 2 and up set. I always tell them, "Go home and sing this for mommy or daddy, and don't forget the GOTCHA at the end!" I don't know if this was a purchased set, but I took screenshots of the characters, printed them out, and cut my own out of flannel. I was limited in materials, but managed a good enough set to use. The kids LOVED doing this song, and did the gestures with enthusiasm. In fact, we sang it twice at each program. They especially liked the "Oh, no!" part. I did the gestures slightly differently from Diamond or from the mom at this website, but it's a cute video of her singing it with her daughter. This week's Flannel Friday is being hosted by Lisa at LibraryLand.